If you are looking for a 27″ monitor that is well priced and still good for gaming then the Asus VX278H could be right up your street. It has a tonne of options, a super fast 1ms response time and plenty of screen space for you to sit back and take in whilst blasting demons in the latest Doom. There is not a lot to say about the design. It is a very standard black monitor with a basic round stand. It looks like a a standard monitor, it doesn’t stand out but it doesn’t look ugly either. The black borders are a bit on the thick side but the ultra thin bezels tend to come on more expensive products so I think, in this case, you get what you pay for. The stand itself has limited adjustment capability, you get the option of a small tilt (forward 5°, backwards 20°) but that’s it. Connectivity takes the form of a VGA port and 2 HDMI sockets. This is useful if you wish to hook this up to a console as well as your PC. Not all monitors at this price point will feature two HDMI ports. Speakers are included but don’t ever go buying a monitor an expecting top notch hifi sound. They’ll do the job but most gamers will stick to their high quality headphones. So, the build of this is fairly standard. There’s nothing that sticks out to my mind, but the good news is that this screen stands up well in the gaming stakes. OK, so we’re limited to 1080p and 60hz, it’s not going to compete with monitors in the next bracket but then you aren’t paying for top of the range. However it does do a good job of playing fast paced games thanks to its gaming presets and fast response times. Owners report back a good experience. 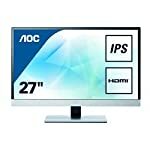 If you are looking for a larger screen at the cheaper end of the scale that will make a good fist at game playing then this is going to be on your short list. We give the Asus VX278H a 4.5 out of 5 rating. Want to know what existing owners of the monitor think? You can read real user reviews here. 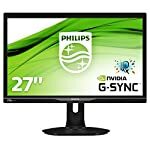 Should I buy the Asus VX278H? The Asus VX278H is an affordable 27" model featuring a TN panel. This gives it fast response times so that it keep up with your games. It's limited to 60hz and 1080p but that sounds reasonable for the price. If you are having some doubts about this purchase then why not read some real owner reviews and see what other buyers think. Welcome to the Asus VX278H FAQ. This section attempts to answer common questions you may have, please get in touch if you have any more queries or if you think our answers need updating. 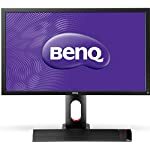 Is this locked to 60hz? 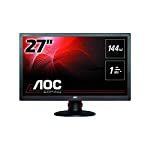 Yes this is a 60hz screen, it may be possible to overclock it but this would only reduce stability and shorten lifespan. If you want a higher refresh rate, you might want to spend more! Do I get a free download of Doom with this? At the time of writing ASUS are running a promotion which gives a free PC download of the 2016 Doom game. This is set to expire at the end of August 2016. Please contact ASUS to confirm eligibility.